Gestational diabetes mellitus (GDM) is a global public health concern with potential implications for the health of a mother and her offspring. However, data on the prevalence and risk factors of GDM in Latin America are scarce. The study was designed to estimate the prevalence of GDM and identify maternal risk factors among Peruvian women. A cross-sectional study was conducted among 1300 pregnant women attending a prenatal clinic in Lima, Peru. GDM was diagnosed using an Oral Glucose Tolerance Test (OGTT) performed between 24 and 28 gestational weeks using the International Association of Diabetes and Pregnancy Study Groups (IADPSG) criteria. Depression status was assessed using the Patient Health Questionnaire-9. Multivariate logistic regression models were used to identify risk factors of GDM. Approximately 16% of pregnant women were diagnosed with GDM. The prevalence of obesity and depression were 24.4 and 10.6%, respectively. After adjusting for confounders, mid-pregnancy obesity was associated with a 1.64-fold increased odds of GDM (OR: 1.64; 95% CI: 1.03–2.61). Participants with a family history of diabetes had a 1.5-fold increased odds of developing GDM (OR: 1.51, 95% CI: 1.10–2.07) as compared to women without this family history. Depression was associated with a 1.54-fold increased odds of GDM (OR: 1.54; 95% CI:1.09–2.17). GDM is highly prevalent and was associated with maternal obesity, family history of diabetes and antepartum depression among Peruvian women. Intervention programs aimed at early diagnoses and management of GDM need to take maternal obesity, family history of diabetes and antepartum depression into account. Gestational diabetes mellitus (GDM) is a non-communicable disease affecting pregnant women [1, 2]. Globally the median estimates of GDM range from 6 to 13% . In the United States, recent estimates show up to 9% of all pregnancies are complicated by GDM . In Central and South America, the recent overall prevalence of GDM is estimated at 11% . There is well-established evidence showing that women with GDM are at risk for preeclampsia [4, 5], premature birth , increased risk of cesarean section [4, 5] and later development of type 2 diabetes . GDM is also associated with increased risk of perinatal complications including malformations , shoulder dystocia , neonatal hypoglycemia , and perinatal mortality [8, 9]. Obesity and a family history of diabetes have been consistently identified as major risk factors for GDM in previous studies . Other risk factors for GDM include advanced maternal age , nonwhite race [10, 11], previous unexplained stillbirth [12, 13], and obesity [10, 13]. In addition to increased GDM risk, maternal obesity increases the risk of multiple adverse maternal health outcomes including thrombosis , gestational hypertension , preeclampsia [16–18], preterm delivery , and cesarean section [16, 18]. Of note, significant neonatal complications have been associated with obesity and GDM. These include congenital anomalies [20, 21], macrosomia , and birth injury [23, 24]. An expanding body of evidence now implicates unipolar major depressive disorder as one of the major risk factors for and conditions co-occurring with GDM , although the evidence is inconsistent . Peru, a middle-income country, is one of the countries experiencing an epidemiologic transition with increasing burden of non-communicable disease risk factors [27, 28]. A 2014 national survey in Peru of people ≥15 years old showed the prevalence of overweight is 35% and the prevalence of obesity is 18% of the population . However, the prevalence of GDM and its risk factors have not been investigated in Peru. Given this gap in the literature and the increased burden of non-communicable diseases in the country, we sought to examine the prevalence of GDM and associated risk factors in a cohort of pregnant women in Lima, Peru. The Screening Treatment and Effective Management of Gestational Diabetes Mellitus (STEM-GDM) was designed to evaluate the prevalence of GDM among Peruvian women attending perinatal care and to provide evidence to improve the local guidelines for standardized GDM screening/diagnosis, effective management, and treatment. Participants were 1300 pregnant women attending prenatal care clinic at the Instituto Nacional Materno Perinatal (INMP) in Lima, Peru (Additional file 1). Recruitment occurred between February 2013 and June 2014. The Instituto Nacional Materno Perinatal (INMP), overseen by the Peruvian Ministry of Health, is the primary referral center for maternal and perinatal care in Lima, Peru. Women were eligible if they were at least 18 years of age, had a gestational age of 24 to 28 gestational weeks, and could speak, read and write Spanish. Participants were excluded if they planned to deliver at another hospital or location, date of last menstrual period not certain and not confirmed by ultrasound exam performed prior to 24 weeks of gestation, unable to complete an oral glucose tolerance test (OGTT), known to have a multiple pregnancy, had a previous diagnosis of overt diabetes requiring treatment with medication before the pregnancy, or were currently receiving medical treatment for chronic diseases, such as oral glucocorticoids, thiazide diuretics, β-blockers, ACE inhibitors, oral β-mimetics, Dilantin, or antiretroviral agents. All participants provided written informed consent. Study procedures were approved by institutional review boards of the INMP, Lima, Peru and the Harvard T.H. Chan School of Public Health Office of Human Research Administration, Boston, MA, USA. GDM cases were identified using the OGTT, which is considered the gold standard for this diagnosis. For the OGTT test, participants were appointed to the laboratory at INMP between 8 AM to 9 AM after 8-h overnight fasting. A trained lab technician obtained a basal venous blood sample of 15cm3 for measuring fasting plasma glucose (PG). Participants were administered 75 g of anhydrous oral glucose dissolved in 250 ml of water. After 1 and 2 h, new venous blood samples were obtained for measuring PG levels. Plasma glucose value was measured by the glucose oxidase-peroxidase method in duplicate using an auto-analyzer for biochemical tests. Standard clinical laboratory quality control assessment of the OGTT testing was completed to assure reliability and validity of measured plasma glucose. According to the standard OGTT testing procedures outlined by the IADPSG recommendations , pregnant women were considered to have GDM if fasting plasma glucose (PG) was ≥92 mg/dl (5.1 mmol/l), 1 h-h PG ≥180 mg/dl (10 mmol/l), and/or 2-h PG ≥153 mg/dL (≥8.5 mmol/L). Overall, 205 women were diagnosed with GDM. Of the GDM diagnosed women, 186 women (90.7%) had a fasting PG ≥ 92 mg/dl, 29 women (14.1%) had a 1-h PG ≥180 mg/dl, and 24 women (11.7%) had a 2-h PG ≥153 mg/dL. Women diagnosed with GDM received glucometers, nutritional advice, and clinical care to manage their condition. Women were interviewed using a structured questionnaire to collect detailed information on sociodemographic, lifestyle characteristics, medical and reproductive history. Sociodemographic information collected included participants’ age, family history of diabetes mellitus among first degree-relatives, body weight, height, smoking status, and alcohol use. Other covariates included maternal and paternal education (≤6, 7–12, > 12 years); ethnicity (Mestizo vs. others); marital status (married/living with partner vs. others); employment status (employed vs. not employed); difficulty paying for the basics (very hard/hard, somewhat hard, not very hard); difficulty accessing medical care (very hard/hard, somewhat hard, not very hard); food insecurity (no vs. yes), and perceived health during pregnancy. Pre-pregnancy body mass index (BMI) and mid-pregnancy BMI were calculated as weight (in kilograms) divided by the square of height (in meters and used to identify normal weight (BMI < 25 kg/m2), overweight (BMI: 25–29.9 kg/m2), and obese (BMI ≥ 30 kg/m2)) women. Due to the small number of underweight women, this group was merged with normal weight women. For the purpose of our analysis, obesity was grouped into a single category of BMI of 30.0 kg/m2 and higher. Depression status was assessed using the 9-item Spanish-language Patient Health Questionnaire-9 (PHQ-9) [31, 32], which has been validated in a population of pregnant Peruvian women . The PHQ-9 score was calculated by assigning a score between 0 and 3 to the response categories of “not at all,” “several days,” “more than half the days,” and “nearly every day.” Depression was defined as a PHQ-9 score ≥ 10. Sociodemographic characteristics were evaluated using numbers (%) for categorical variables and means (± standard deviations) for continuous variables. Chi-square tests and Student’s t-tests were conducted to compare distributions between women with and without GDM. Prevalence estimates were determined for GDM in relation to socio-demographic and behavioral characteristics. Adjusting for covariates of interest, we used multivariable logistic regression procedures to calculate odds ratios (OR) and 95% confidence intervals (95% CI) to estimate associations of GDM with risk factors. Forward logistic regression modeling procedures combined with the change-in-estimate approach were used to select the final report models . Variables of a priori interest (e.g., age and BMI) were forced into final models. All analyses were performed using IBM’s SPSS Statistical Software for Windows (IBM SPSS Version 22, Chicago, Illinois, USA). All reported p-values are two-sided and deemed statistically significant at α = 0.05. Maternal sociodemographic and reproductive characteristics of the study population are presented in Table 1. The average age of study participants was 28.9 years (± 6.1). A majority of participants were married or living with a partner (86.5%), Mestizo (98.1%), and unemployed (67.8%) (Table 1). The overall prevalence of GDM in our population of Peruvian pregnant women was 15.8%. The prevalence of mid-pregnancy obesity was 24.5% while 10.6% of them had depression. Compared to women without GDM, women with GDM were significantly older (p = 0.013), more likely to report a family history of diabetes (p = 0.005), have higher mid-pregnancy BMI (p = 0.016) and have depression (p = 0.012). The prevalence of GDM increased significantly with the presence of family history of diabetes mellitus (p = 0.005) and maternal mid-pregnancy obesity (p = 0.02) (Fig. 1). In an unadjusted bivariate analysis, participants with a family history of diabetes had 1.53-fold increased risk of GDM (OR: 1.53, 95%CI: 1.13–2.07), and participants with mid-pregnancy obesity had 1.83-fold increased risk of GDM compared to those of normal weight (OR: 1.83, 95%CI: 1.19–2.81) (Table 2). Compared to non-depressed participants, those with depression had a 1.5-fold increased odds of GDM (OR: 1.52, 95%CI: 1.09–2.12). After adjusting for age and family history of diabetes, the association between depression status and GDM remained significant (OR: 1.53, 95%CI: 1.09–2.14). In a multivariate model, a family history of diabetes remained significantly associated with GDM (OR: 1.51, 95%CI: 1.10–2.07), mid-pregnancy obesity slightly increased the risk for GDM (OR: 1.64, 95%CI: 1.03–2.61), and depression was also significantly associated with GDM (OR: 1.54, 95%CI: 1.09–2.17) (Table 2). To the best of our knowledge, this is the first study to examine the prevalence of GDM in Lima, Peru using the IADPSG criteria, as well as the presence of family history of diabetes mellitus, maternal mid-pregnancy obesity, and maternal depression as independent risk factors of GDM. Approximately 16% of pregnant women were diagnosed with GDM. The prevalence of obesity was 24% and the prevalence of depression was 11%. A previous study by Sacks et al. using IADPSG criteria and a multinational cohort (n = 23,957) reported the prevalence of GDM varies from 9 to 26% and is associated with older maternal age, BMI, family history of diabetes, mean OGTT glucose values, and ethnicity . Globally, the prevalence of GDM varies by study setting and diagnostic criteria. Additional influencing factors include age, obesity, and use of health services. For instance, using International Classification of Diseases (ICD) diagnostic codes (ICD-9 and ICD-10), GDM prevalence was reported as 6% in the USA , and 10% in Korea . A meta-analysis of 22 studies in sub-Saharan Africa with a range of diagnostic criteria and study setting reported a GDM prevalence of 2–6% . A study in China using a 75-g 2-h OGTT reported a GDM prevalence of 8%. A higher percentage of GDM diagnoses were made by fasting PG than 1- or 2-h glucose levels compared to previous estimates. 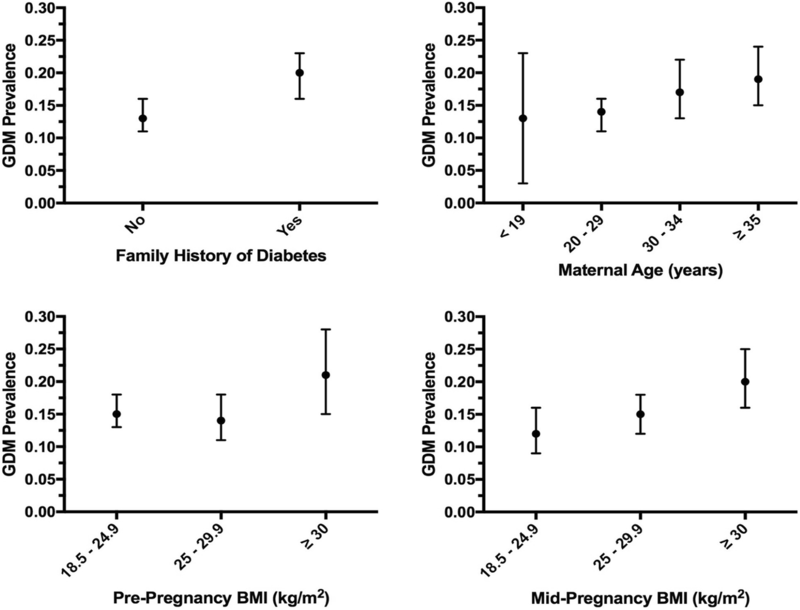 We found a significant association between GDM and mid-pregnancy obesity (BMI > 25). Maternal age of 30 years or older and family history of diabetes were also significantly associated with GDM. Our results are in general agreement with previous studies that have identified similar associations with GDM risk factors. For example, Kumari et al., found a GDM prevalence of 24.5% in obese compared to 2.2% in non-obese women (P < 0.0001) . In a retrospective cohort study of 613 obese (BMI > 35; class II and III) and 11,313 non-obese women, there was a threefold increase of GDM for obese patients compared to non-obese women (OR: 3.2, 95%CI: 2.5–4.2) . In a recent meta-analysis of published literature, Chu and colleagues reported ORs of developing GDM of 2.14 (95% CI: 1.82–2.53), 3.56 (95% CI: 3.05–4.21), and 8.56 (95% CI: 5.07–16.04) among overweight, obese, and severely obese compared with normal-weight pregnant women, respectively . According to Kim et al. in a study of pregnant women from Florida, USA, the likelihood of GDM increased with increasing BMI was significant for all racial/ethnic groups investigated . Additionally, the proportion of GDM cases attributable to overweight and obesity was 41.1% overall . The HAPO Study Cooperative Research Group has demonstrated that higher maternal BMI is associated with increased likelihood of pregnancy complications, including complications related to fetal growth, adiposity, and preeclampsia . There is a growing body of epidemiologic evidence that shows depression as a risk factor for GDM [43, 44]. Our study results showing a significant association between depression and GDM is in general agreement with some prior studies [25, 43] but not all . Recently, a longitudinal study in the USA from Hinkle et al. found that persistently high depression scores in the 1st and 2nd trimesters were associated with three-fold increased risk of GDM (highest vs lowest quartile in both trimesters: RR: 3.21, 95% CI: 1.00–10.28) . In a cross-sectional study, women with GDM were more than three times more likely to have a history of depression compared to non-depressed women (OR: 3.79, 95% CI: 1.07–13.45) . However, using data from prenatal care clinics at a University of Washington Medical Center, Katon et al. found no evidence of association between GDM and antepartum depression (OR = 0.95; 95%CI: 0.68–1.33) . In a addition, a 2016 meta-analysis shows there is no clear consensus on the association between depression and diabetes during pregnancy and additional studies are needed . Although we do not have a clear explanation for these findings, we speculate that differences in nutrition, physical activity, and other lifestyle characteristics may have contributed to the observed differences. Pregnancy is a major life event that increases vulnerability to depression, and pregnant women who have comorbid depression and GDM with serious implications for both maternal and infant outcomes. This study had several strengths, including the use of trained interviewers and standard laboratory procedures for measuring plasma glucose. Our relatively large sample size and the high prevalence of gestational diabetes give us statistical power to study the associations of interest. However, some limitations must be considered when interpreting the results of our study. First, a family history of diabetes was assessed based on self-report; therefore, we cannot rule out recall bias. Additionally, previous studies have shown associations between GDM and adverse pregnancy outcomes. However, information on pregnancy outcomes was not collected in our study cohort. Lastly, participants in this study were pregnant women living in Lima, and the results may not be generalizable to the whole Peruvian population. Future studies that collect objective measures potentially associated with GDM and obesity may overcome concerns about these potential errors. Overweight and obesity may be prevented by implementing a healthy lifestyle that includes physical activity and nutritional counseling before pregnancy. If women are already obese when they become pregnant, O’Dwyer et al. suggests early screening for women with a body mass index > 34.9 kg/m in order to optimize maternal glycemic control during pregnancy . In a retrospective cohort study, Lutsic et al. found that the proportion of women with maternal or delivery complications was highest among overweight or obese depressed pregnant women . These studies provide evidence of a high prevalence of GDM in women with an elevated mid-pregnancy BMI and depression. GDM is prevalent in this population, especially in overweight/obese and depressed pregnant women. Our findings may be used to develop and implement programs aimed at supporting high-risk mothers in antenatal care. The authors wish to thank the dedicated staff members of Asociacion Civil Proyectos en Salud, Peru, and INMP, Peru, for their expert technical assistance with this research. This research was supported by Roche Diagnostic Operations Inc., project number 208617-5074547 and National Institute for Minority Health and Health Disparities, National Institutes of Health (T37-MD0014490). GLT, MALF, BG, SES, and MAW conceived and designed the study. SM, BG, SES, and MAW analyzed data and drafted the manuscript. GTL, SM, MALF, SES, PMS, JI, WC, RZ, MG, VM, PP, BG, and MAW interpreted the data, critically revised the draft for important intellectual content, and gave final approval of the manuscript to be published. All participants provided written informed consent. Study procedures were approved by institutional review boards of the INMP, Lima, Peru and the Harvard T.H. Chan School of Public Health Office of Human Research Administration, Boston, MA, USA. The authors declare that they have no competing interests and the content is solely the responsibility of the authors. The funding agency did not participate in the writing of the manuscript or the decision to submit it for publication.